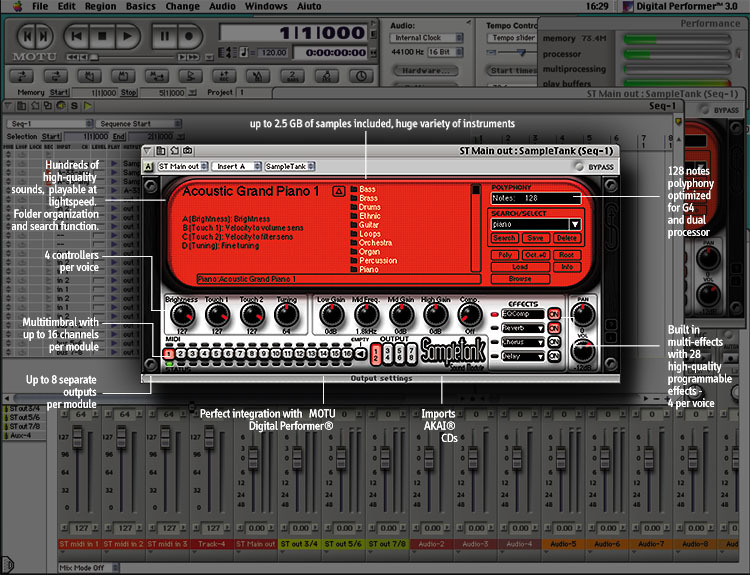 October 2001, Modena, Italy – Following the success of the SampleTank® software Sound Module, Italian music software developer IK Multimedia is pleased to announce the new 1.1 MAS version for MOTU Digital Performer®. SampleTank (http://www.sampletank.com) is the first professional software sound module to combine a powerful synth/sampler engine and high quality multi-sampled sounds into a plug-in software instrument. The new MAS version is a native plug-in which allows for the first time MOTU Digital Performer® users to access a fully integrated sample-based professional sound module, vastly increasing the compositional possibilities of their favourite sequencer. "Digital Performer users will truly enjoy the many advantages SampleTank brings to their DP virtual recording studio, especially the massive sound libraries that are now just one click away with no setup hassles", said JimCooper, MOTU Director of Marketing. "We're excited to support Digital Performer, one of the best and most complete Macintosh sequencing application on the market. The combination between DP and SampleTank will give users an unprecedented level of creative possibilities", said Enrico Iori, CEO of IK Multimedia.